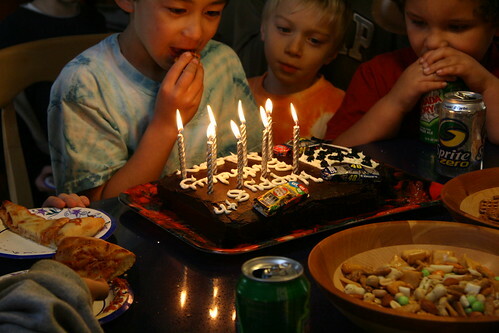 It seems that every other year Adam has a huge birthday party. Last year he had a smaller party with 7 kids, and it poured outside. Luckily, we had air hockey, Twister and a civilized pinata with pull strings indoors. This year, 17 kids replied yes to his invitation. We could only pray for good weather and thankfully we got it. Still, 17 seven- and eight-year-old boys? We must be insane. So how exactly did we entertain these kids? We brought out the trusty moonwalk that Adam received when he was three, and made a rule that only four boys were allowed at one time. As you can see, it was pretty hard to enforce, but they were much better when I was policing them. Grandma (my mom) took this picture and was encouraging mayhem. We then had to add rules like jumping only, no wrestling, and no falling on the walls which makes the moonwalk collapse. Adam and his friends are getting way to big for this BJs special, so we may not bring it out next year. 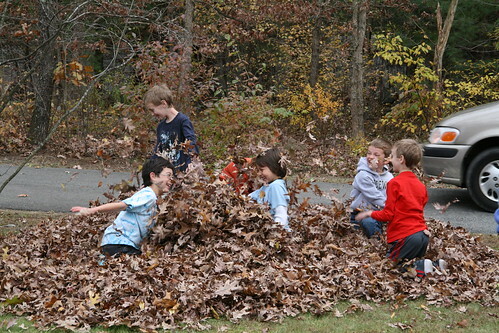 Doug's carefully blown leaf piles were destroyed by the boys jumping, wrestling and stuffing leaves in each other's faces. There is pure joy in every one of those faces. 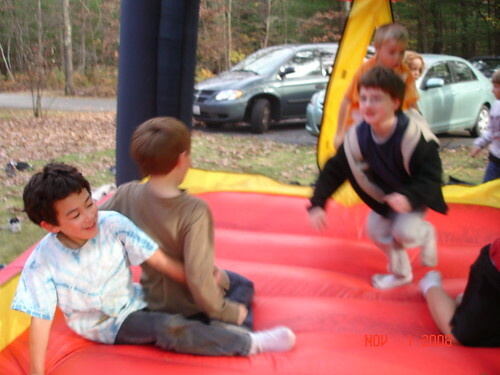 Dova got to play with a classmate whose brother came to the party. 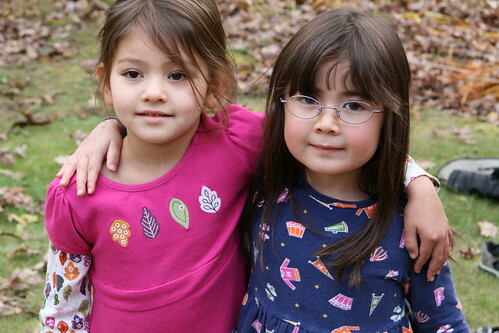 Rachel (left) is half Japanese, where Dova is half Chinese. Our NASCAR party wouldn't be complete without a NASCAR cake. That's Kyle Busch, Jimmie Johnson, and Jeff Gordon racing on top of it. 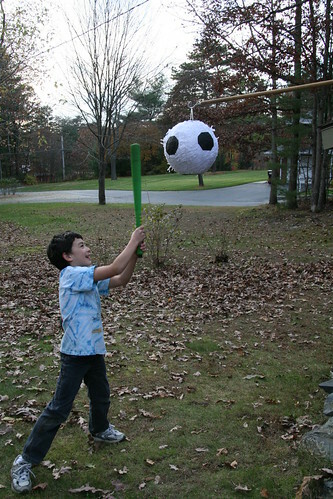 Adam got to hit the soccer ball pinata first. We gave each person 3 whacks, but it didn't last the entire line. 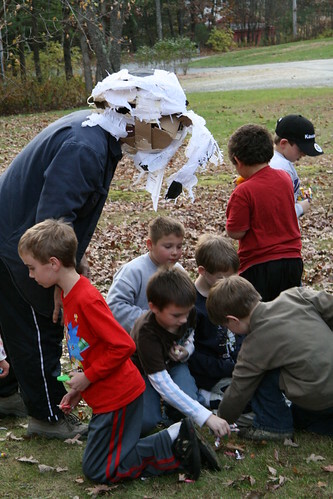 Here's the mad dash for the candy, with a dad pitching in as Mr. demolished soccer ball head. Thankfully, there were no injuries with all those high energy boys. The only casualty was Adam's glasses. 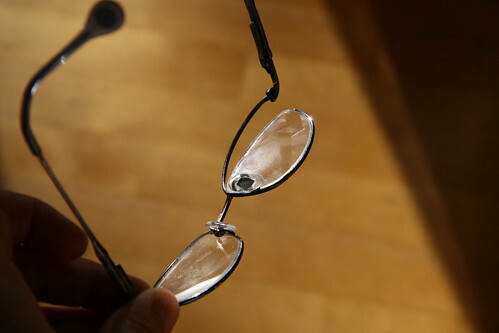 Luckily, another pair had already been ordered as they were already somewhat broken. All in all, it was a fantastic but exhausting day. Looks like the kids had a great time!